Figure 3.3 The internal structure of the Sun. 5500°C. From Earth the surface looks smooth, but it is actually turbulent and granular because of convection currents. Material boiled off from the surface of the Sun is carried outward by the solar wind. The surface of the Sun also contains dark areas called sunspots. Sunspots appear dark because they are cooler than the surrounding photosphere -about 3500°C compared with 5500°C. They radiate only about one-fifth as much energy as the rest of the photosphere. Sunspots vary in size from 1000 km to over 40 000 km across. As they move across the surface of the Sun, sunspots usually change shape - some disappear, and new ones appear. Their lifetime seems to depend on their size, with small spots lasting only several hours while larger spots may persist for weeks or months. The rate of movement of sunspots can be used to estimate the rotational period of the Sun. At the equator, sunspots take about 25 days to move once around the Sun. At the poles, sunspots take about 36 days to go around the Sun. This odd behaviour is possible because the Sun is not a solid body like the Earth. Sometimes sunspots appear in isolation, but often they arise in groups. Sunspots and sunspot groups are directly linked to the Sun's intense magnetic fields. Such spots are areas where concentrated magnetic fields break through the hot gases of the photosphere. These magnetic fields are so strong that convective motion beneath the spots is greatly reduced. 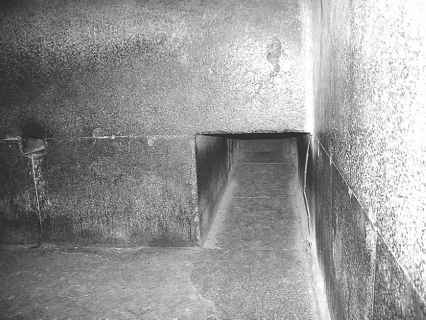 This in turn reduces the amount of heat brought to the surface compared with the surrounding area, so the spot becomes cooler. Data obtained from space probes like SOHO have shown that the strength of the magnetic fields around sunspots is thousands of times stronger than the Earth's magnetic field. Sometimes these magnetic fields change rapidly, releasing huge amounts of energy that hurl out massive amount of gas as solar flares into the Sun's atmosphere. from a telescope onto a white screen. Observations of the Sun in this way need to be made carefully so as not to damage the viewer's eyes - NEVER look at the Sun through a telescope! Like many other features of the Sun, the number and location of sunspots vary in a cycle of about 11 years. Heinrich Schwabe, a German astronomer, first noted this cycle in 1843. 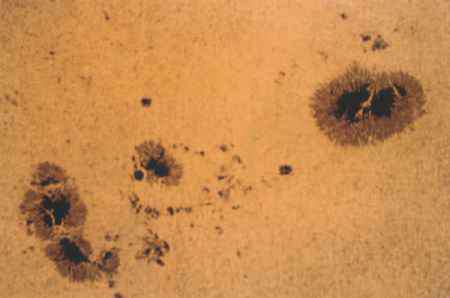 Sunspot maximums occurred in 1968, 1979, 1990 and 2001. Sunspot minimums occurred in 1965, 1976, 1986, 1997 and 2008. The average latitude of sunspots also varies throughout the sunspot cycle. At the beginning of a sunspot cycle, most sunspots are at moderate latitudes, around 28° north or south. Sunspots arising much later in each cycle typically form closer to the Sun's equator. The variation in the number of sunspots is now known to be the most visible aspect of a profound oscillation of the Sun's magnetic field that affects other aspects of both the surface and interior.